Thankful Thursday... The Halloween/ Fall decorations are up! Thankful Thursday... All my Halloween/ Fall seasonals are up! The witchy side.... all orange and black. This is what started my Halloween decor two years ago. I had never decorated for Halloween until I saw these cute jars in a store and thought, " A little bit of Halloween wouldn't hurt."... now I have got mostly Halloween and I am loving it! it was a fun project! Plus I got a few new skulls.... You can never have too many skulls laying around your house! My FAVORITE new Halloween addition... "Quoth the Raven, Nevermore!" I saw this sign at Dear Lizzy and LOVED it! I reminds me of teaching English... every year my classes would study Edgar Allan Poe and then we would read "The Raven"... I sure wish my name was LeNore, righ about now! Mitch told me I had WAY overdecorated, Caylor said he felt haunted, Jacks thought I had lost it... & Meg loves it! What do those boys know anyways? 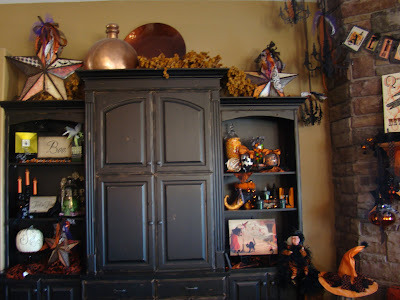 While I have been in love with Halloween decor... I can't forsake my first love...FALL!
" I have got to get my Halloween and Fall decor up, because I've got so much Christmas , I will have to start that soon... maybe before Halloween." I just laughed! We are kindred spirits! My favorite FALL thing... My Autumn witch. Not a Halloween witch, but decorated with leaves and acorns... she is perfect until Thanksgiving! The best thing about her is she was a gift from a dear friend... now every year forever- I will think of her while I decorate for my favorite season! 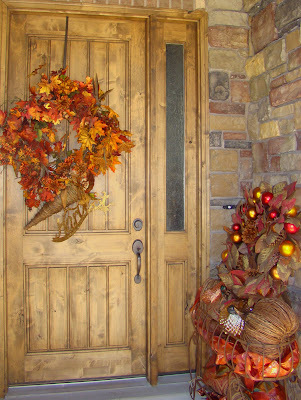 Pumpkins and Feathers... Gotta Love the colors of the season! This is my front porch... A little bit fall... I will probably put some real pumpkins out when the weather finally starts co-operating Mother Nature needs to get the memo that it is FALL! This is part of what is on my table... A few pumpkins and an acorn and a cornucopia. I went to a movie by myself! I was in 3rd grade or so and I was supposed to meet some friends at the movie theater. I think my dad just dropped me off at the "new" movie theater on the red hill and told me he would be back in two hours. Kramer Vs. Kramer was the movie being shown and all my friends decided they didn't want to see it and I didn't get the memo. So... I sat through Dustin Hoffman and some ugly little long haired boy dealing with a divorce. Yes, I was in 3rd grade. I guess I didn't tell my mom which movie I was seeing. I couldn't watch Three's Company, so I doubt Kramer vs. Kramer would have been on the family viewing list. That is random and wacky and I really can't believe I just got dropped at the theater alone, but it really did happen. So my first experience was pretty crappy... I didn't want to do it again. Two weeks ago I was at the Gateway and tried to get my ipod fixed. I hadn't made an appointment with the genius, so they couldn't help me until the next day. I made some returns and just really didn't have anything else to do. I saw the movie poster for Julia & Julie and remembered how I loved the book and wanted to see the movie, but couldn't really ever hook up with friends to see it. Right then... I got the idea to just go by myself and then felt totally like a loser for thinking that. Then I decided... I was going to see it by myself! I got all determined and cocky. I bought Caylor some birthday presents, got a Costa Vida salad, went outside WITH my sunglasses and totally checked out every person walking by. That's right TOTALLY stared at the people at the gateway and ate my salad ALONE! I LOVED IT! I gawked until it was movie time, bought myself a nice LARGE coke and entered the theater. I was a little embarrassed, thinking I was such a LOSER! I laughed out loud at the movie... drank my coke and had the best time. I felt totally secure- I didn't care that I was alone! I am no longer a loser for going to the movie alone...just someone who found her own company to be quite enjoyable! It was much better than Kramer vs. Kramer. Thankful Thursday... Fall... Bring it on! Today I am most thankful for one very important thing: Fall! I have not been feeling well so... I just haven't been in the mood. Add all these things together AND it means... Fall is on its way! More orange and black than I can even begin to describe! and tomorrow I am going to decorate! Once the weather truly cools down I will be in absolute Fallish heaven! It IS the best time of the year! Happy Day to My MAN! 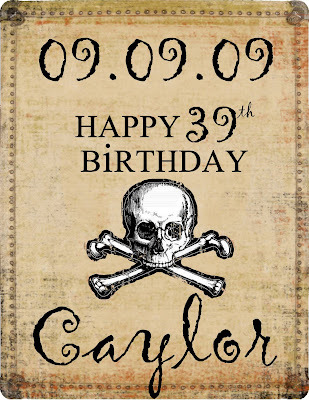 Wednesday 09.09.09 was Caylor's 39th birthday! I guess a somewhat cool numbered birthday has rolled around every ten years for him... so he was over it. I racked my brain thinking of things that had to do with the letter 9. Dressed to the 9's- a new outfit. The tag said it was his new birthday suit. You deserve the whole 9 yards- Some football things.. tickets, a poster, etc. The tag said... You can't use this on the links... You won't holler FORE! It keeps you looking o' so crisp. I even got him some tattoo sleeves... because I am alway wanting him to get a tattoo and he always just laughs... maybe for the big 4-0? So... My thinking on adding the skull and crossbones to everything that it can be on the poster this year and on the arm next... He told me to keep dreaming! THe kids were excited to help me wrap and put it all out for him! We ended the evening by going out to Texas Roadhouse for dinner. Jackson was very disappointed when he wouldn't sit in the saddle as they announced his birthday. It made its rounds on the blogosphere and the facebook circuit. He thought with friends like that... who needs enemies! 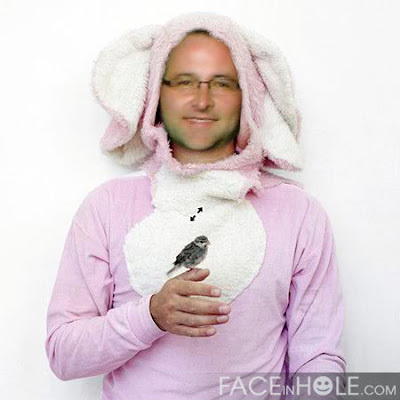 So... my tough guy... skull and crossbones...humble businessman...fluffy bunny is now 39. It was funny when on 9.10 I told him he DID look a day over 39.... I am such a comic genius! So... Happy Birthday ( two days late) to my man! HE is really the best thing that ever happened to me... If you don't believe me... just read my mom and dad's letter to him. He is the best... I am one lucky lady! I want everyone in the blogosphere to meet the best gram in the whole world! Connie... Constance for real, but I just like to call her Con, Constantinople or Constantine! She is the best... she was only 40 when I was born, so she really is young enough to be my mother! As Dennis the Menace so beautifully said, "She is the best old gal on the block!" We love to get her to St. George... the photo above was taken at my sister's house and we were all having a wild party. 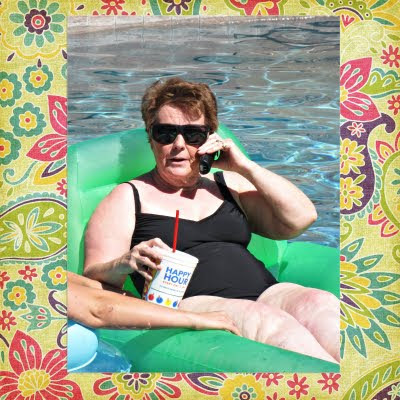 Gotta love the Route 44 Diet Coke...the shades...the raft... and the cell phone. She is GLAM! This Grandma is no stick in mud... We took her to Chico's and made her get a whole new spring/ summer wardrobe. Orange flip-flops included! When we all went to Park City she stayed longer and had her quilting friends come up to party. BTW... Her quilting gals call themselves "The Ladies of the Evening"... scandalous? No... They quilt all night long! 18 months ago my Grandpa Garth died after years of fighting Parkinson's Disease. When we tease Con about dating or getting a boyfriend she quickly pipes up with, " THE only thing a man would want is a purse or a nurse... I have my own purse and I don't want to be their nurse...NOT INTERESTED!" She is a firey babe! My kids are so lucky to have such young AND young at heart great grandma. Caylor loves her and she loves him right back. Sometimes if we are disagreeing about something he will teasingly tell me to call Connie to see what she has to say... He knows she will always pick his side. Our family absolutely adores our Grandma Connie... I am going to join my sister, Brandy, in the dog house for posting this pic, but it IS PRICELESS! 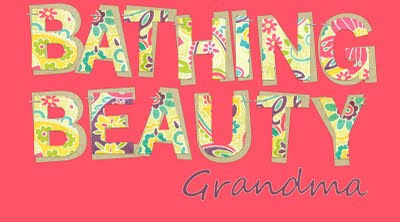 She is priceless and we are all very lucky to have such an amazing grandma! 10. Caylor, with the help of Steve Kemp, killed a bat at our first apartment. 13. oh, yeah... what color is my blog right now? 14. When I was first born, we lived in a mortuary. 16. I Have felt like I don't have anything to say on my blog anymore. 18. I would almost sell my soul to the devil for a swimming pool in my backyard. 19. I miss being really tan...but I am now afraid of skin cancer. 20. I put vinegar on most of the vegetables I eat. 21. I don't collect anything. 22. Sometimes I am really bored, yet my house is a disaster. 23. I am the oldest child of 4, 2 sisters and one brother. 24. Thanksgiving is my favorite holiday! 25. I have unusually short arms... pretty much alligator arms. 26. I cut off over 18 inches of hair at one time. 27. I wish permed hair would come back in style... I rocked it the first time around! 28. I totally loved Caylor the first time I met him... He didn't really notice me. 30. We have been married for 17 years. He still thinks I am kindof hyper weird. 32. I took it back to ipod ( I bought the warranty) and played dumb and got a new one. 33. I am happy the nice guy at the apple store hooked me up! 34. I want a new apple computer and laptop. 36. so... no new apple computer and laptop! 37. I don't know if I can list 101 random things about myself. 38. I still don't know what to say. 43. Life, the Office, and I am soooo excited to get into Glee... I laughed out loud at the pilot. 44. My feet are in desperate need of a pedicure... but my wallet is more in need of cash. 45. There is something about fall that makes me want to create! 46. I am going to start making aprons... it has been a while. 47. It is the the beginning of the 37th week of the year today. 48. I wanted to read 52 books this year... I am only at 26... I don't know if I will make it. 50. It is not a good thing for my fewer carbs diet I am going to try. 53. I need to travel more! 54. Sometimes I like to say hell... among other things. 55. My mom is the life of any party... she is the most fun person I know! 56. I call my mom by her name... VIV! 57. My sisters and I all look quite a bit alike. 58. Nobody in Caylor's family looks alike, but they all sound alike... well -the brothers anyway. 60. The dressing up and the parties at school stress me out. 61. Cyndi Lauper was my absolute favorite singer when I was in high school. 62. I met her and got her autograph when I was 16. 63. Someday I am going to write a book about growing up in a mortician family. 64. I like to shop and spend way, way, way to much money! 65. I DO NOT like to wear tennis shoes unless I am working in my yard or working out! 66. My first kiss was the summer before 9th grade... it was with A.T.
67. I didn't really like him... it was, as we said in the 80's, "just a scam". 68. I am still doing my project 365. 67. I am two weeks behind... I have got to get with it and stay current! 68. I love treats- cinnamon rolls and baked goods rock my world! 69. I am also a diet pepsi slave... I love to drink! 70. I love to entertain and have parties, yet haven't for awhile. 71. I have over ten sets of dishes... it is the first thing I look at in a store. 72. I am NOT an animal lover! 73. Some of my friends have cats and I want to disown them...just kidding! 74. I told the littlest cat owning daughter that "I eat cats" and then had to say "JK". 75. Not going to happen! 77. sometimes that makes me sad. 78. usually NOT in July, though. 79. I was in Donny Basile's class with Mindi... and he was a jerk to her. 80. Can you tell I copied this idea from her. 81. I sing in my car.. sometimes loudly. 83. My hair is falling out. 85. That freaks me out... I hide behind my hair. 87. It is all I can do to be nice and cheerful when she throws her am fits. 89. I know, a body like this without any "work" done? AMAZING! 90. You know I am kidding don't you... I know I don't have an amazing body! 91. Do you have any clever ideas using the #9? 92. My man is having a b-day on 9-9. 93. I hate to vacuum... and mop my floor. 94. I am horrible at math... in fact, I just learned my times tables with my son, Jackson. 95. I taught high school English and History for 10 years. 97. I don't love Jane Austen! There I said it... Pride and Prejudice= HATE! 99. Can't believe you still are reading this! 100. I am very insecure without lipstick.